In the modern context, how does the diesel vs petrol engine debate stack up? Back when a beard meant you were the kind of bloke who liked to commune with nature by crushing it in a big heavy SUV, life was simple, and we all knew whether we wanted a diesel-powered, smoke-blowing blunderbuss, or a petrol-slurping car that was more at home on smooth roads or in cities. Today, when a beard can simply mean that you live in Melbourne and believe that your pants should be applied with a spray gun, things are far less clear. Petrol vehicles are still high-revving, peaky pieces of work that drink slightly more, but are more fun for it, and you can still get a diesel 4WD that will take you beyond the back of Bourke, but you will also find plenty of diesels in city cars, from Volkswagen Polos, through Mazda 6s and right up to BMW 7 Series luxo-barges. And you'll find sporty cars parked at your local diesel bowser, which now sits right amongst the petrol ones, rather than being kept off to one side where the truckies get their fill. Diesel has changed; it's gone mainstream and spread its oily little wings into many corners of the car market. You can even get a Porsche with a diesel engine, for goodness sake, although, tellingly, not under the bonnet of a 911, Cayman or a Boxster. Diesel has changed; it's gone mainstream and spread its oily little wings into many corners of the car market, with its offer of greater fuel economy (around a third better) and more range between filling stops an increasingly tempting proposition. 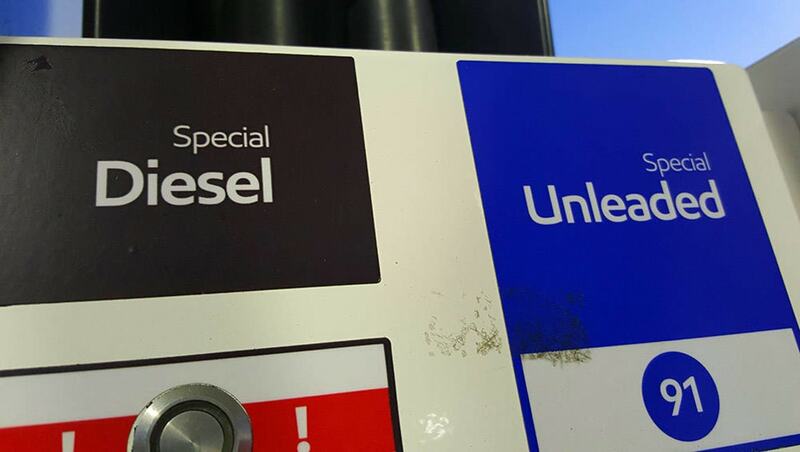 We're nowhere near the European level of diesel take-up, where for some brands diesel is the dominant engine in their fleets (for now, but changes to regulations in some countries will soon change that), but its acceptance has grown vastly. The number of diesels on our roads has jumped markedly in the past five years. In the UK, however, diesel sales have recently fallen almost 40 per cent as a ban on the engine type looks increasingly likely in that country. So, in the modern context, how does the diesel vs petrol engine debate stack up? As a driver, all you really need to know is that diesel and petrol cars deliver their power, or grunt, in different ways. Petrol engines are all about revs, and they tend to achieve their maximum power - or fun point - at a higher number of revolutions. They deliver the excitement of the wind up; as the revs rise and you fang through the gears, speed is piled on. This makes them racier and more involving, at least in theory. Diesel engines deliver their grunt - in the form of torque (or twist as it's sometimes called, which is more descriptive; it's the kind of power that can push you up a steep hill, even with weight on board) - at much lower revs. Diesels are excellent for cruising, particularly on highways, because overtaking power is always on tap, often without even needing to change down gears. The differences are huge and noticeable, with a diesel engine delivering as much as three times more power at a point just above idle. So from1500rpm to 3000rpm, you're getting instantaneous shove. They're more like a draught horse than a race horse, however, because if you push them higher into the rev range, the grunt tails off. This means diesels are excellent for cruising, particularly on highways, because overtaking power is always on tap, often without even needing to change down gears. They're also great for towing things. In the cut and thrust of a windy road, or on a race track, they offer a very different experience to a petrol car, but they can still be fun, and even competitive, as Audi's success in the Le Mans 24 Hour races with diesel engines proves. Part of that success, of course, is built on the diesel car’s ability to go further on a tank of fuel, but more of that in a moment. The science-y and oily part of why diesel is different is all about combustion; the point at which the fuel mixes with air. In a diesel the fluid is fired into the combustion chamber, under pressure, and combustion is instantaneous. Diesel engines don't even need spark plugs, as petrol ones do. They mix their air and fuel outside the combustion chamber in the inlet port. Diesel's other advantage is that it has a much higher compression ratio than unleaded petrol, which makes it more efficient. Read More: What are diesels best at? A big part of the diesel engine vs petrol engine comparison is the fuel-efficiency figures. Diesels are simply better in this department, as much as 30 or even 40 per cent better, although modern, direct-injection petrol engines are catching up. This doesn't just save you money (although the slightly higher price of diesel has to be factored in), it saves you time, because you get more range from a tank - well over 1000km in some cars - and that means fewer visits to the service station. Diesels have become even more efficient, and less wasteful, in the past decade or so with the addition of high-tech electronic injectors and common-rail systems, allowing highly accurate delivery of the diesel fuel, and less production of nasty soot. Diesels cost more than petrol cars, a fact which has to be traded off when it comes to talking about the money you'll save on fuel bills. These improvements have also allowed diesels to sound less like rattly old tractors with asthma and more like cars, although you still wouldn't ever describe them as having an exciting engine sound. Modern cars concentrate on hiding the diesel sounds from the cabin, and they do an excellent job of it. Diesel super cars, however, are sabout as common as Donald Trump's modest moments. The other economic factor, of course, is that diesels cost more than petrol cars, a fact which has to be traded off when it comes to talking about the money you'll save on fuel bills. How much more can vary, but 10 to 15 per cent is a reasonable figure. Car companies will argue that this is because they don't make as many of them, so they have to charge more, or that it's because they have more heavy-duty parts in their engines, or more complexity, which all costs more. (That complexity can also mean a higher service cost, and theoretically shorter engine life). All of these arguments are fairly specious, frankly, and in other markets you may well find a different pricing approach. Paying the extra now also means you'll get slightly more when you sell the car, because when we look at the resale value of petrol vs diesel cars, the perception has been created in the Australian market that diesels are worth more. People tend to bang on about doing the maths, working out how many kilometres you'll need to drive before you get back the extra money you've spent in fuel savings, but realistically it's probably not going to be the killer argument in the end. Let's say you've decided on a Mazda6 or a Hyundai i30, because they're the right size for your lifestyle, you like the styling and they're within your budget. An extra 10 per cent might well take a while to recoup if you don't drive long distances, but in the end, your best bet is to drive both, and decide which one you enjoy more. Unless you really, really hate service stations, in which case you'll take the diesel every time. In the end, it's not possible to say which is better, petrol or diesel engines, because it's very much a case-by-case, or car-by-car thing, and it also comes down to personal preference. Some people just can't stand the sound that diesel engines make, particularly under strain, so they'll never buy one. Although the top European brands, particularly at the high end, now make diesels that are so quiet you can barely tell which engine you're driving without putting the windows down. If you're going to be towing a boat or caravan regularly, it's a no-brainer, because a diesel will do it better, and use far less fuel at the same time. Diesels also tend to rattle and cough more when you're using a start/stop system, which can be annoying, but again, car companies are starting to get on top of this problem. Even Peugeot makes a pretty much flawless start/stop diesel engine now. Partly, it's about what you want to do with your car. If you're going to be towing a boat or caravan regularly, it's a no-brainer, because a diesel will do it better, and use far less fuel at the same time. If you want a sports car, and the thrill of an engine singing at high-revs, you'll want a petrol. That's why, as good as Mazda's diesels are, they don't put one in the MX-5 roadster. It just wouldn't feel, or sound, right. In a small commuter, like the i30, or a mid-size family car like the Mazda6, however, the fact is that the diesel actually feels better to drive. That low-down torque is an absolute boon for small engines, and is far more useable, and enjoyable, on a day-to-day basis. Throw in the economy figures and that makes the extra outlay entirely worth it. One thing you should consider, of course, is diesel emissions, which, as the recent Volkswagen scandal showed us, are a big issue. Some cities, like London and Paris - where the mayor has declared she wants all diesel cars off the road by 2020 - are now moving to legislate against all diesel cars, because of the levels of nitrogen dioxide they produce. The World Health Organisation estimates that nitrogen dioxide causes more than 22,000 deaths every year in Europe. Exposure to nitrogen dioxide can cause lung and heart disease, as well as asthma, allergies and other airborne infections. It has also been linked to sudden infant death syndrome, miscarriages and birth defects. The World Health Organisation estimates that nitrogen dioxide causes more than 22,000 deaths every year in Europe, where roughly half of all cars are diesels (but that number is falling, with the percentage down to 32 per cent in the UK, and dropping). Australians are now burning nearly three billion litres of diesel a year in cars alone, with a further 9.5 billion litres used in commercial vehicles and it is estimated that around 80 per cent of nitrogen dioxide pollution in our cities comes from cars, trucks, buses and bikes. On the plus side, Australia's air is among the cleanest in the developed world, and yet air pollution kills more than 3000 Australians a year, nearly three times the number that die in car accidents. It is worth considering, however, that Australia might, one day, and it could be decades away, follow more enlightened, and more pollution blighted, countries like those in Europe into a diesel ban of some kind. Do you prefer diesel or petrol cars? Tell us what you think in the comments below.